This post will be short as my 'puter is about to run out of battery. The power cable is broken & I'm waiting for the new one to be delivered! I used digi 9702 Eureka Butterfly for my card. I made a little easel card for a child. Using lot's of bright colours. I coloured the image using my Sakura Glitter pens. It's hard to capture the sparkle, but you may see it better below! and has been there for a very long time! I can give credit for it! I coloured the ticket with the pens too! The gems are also from my stash. you can play in the challenge this week! 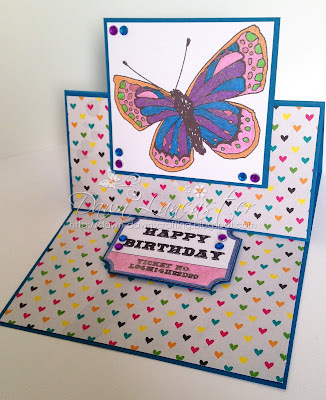 Gorgeous vibrant easel card, lovely butterfly image and papers used. A fabulous card Dawn, such lovely bright colours. I hope your new power cable arrives soon. What a gorgeous butterfly. I love this stand up card, gorgeous work today! Hiya Dawn, hope your cable turned up. A lovely easel card Dawn. Fabulous easel card, love the butterfly!! 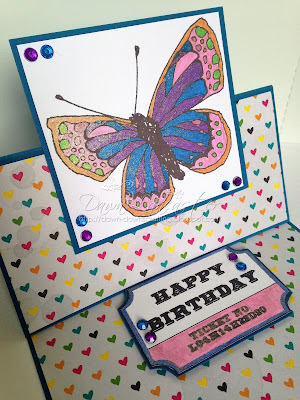 Oh I am loving this card and the wonderful butterfly.